I would like to extend my gratitude to MilkSplash for sponsoring this post. Quinn loves milk, he could drink it all day, everyday if I permitted him too. Brandon Jr on the other hand doesn't like plain regular milk. No amount of bribing can get him to drink it. He doesn't want anything to do with it unless it has some sort of flavoring! And I don't know about you, but I am not to impressed with the amount of calories and fat in the chocolate milk on the dairy shelf. I want my little guy to drink his necessary amount of milk each day, but not with all the extra calories and fat! And lets not forget that we get charged more! I wish I couldn't grab him a small milk and flavor it, but when we are traveling that isn't possible! I needed a flavored milk alternative! 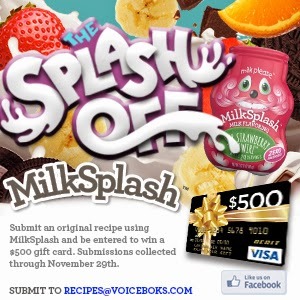 When I found Milk Splash was looking for blogger to try their products, I instantly jumped at the offer! Let me tell you a bit more about their product so you can see why. MilkSplash is a brand new fun zero-calorie milk flavoring. Basically they are a liquid milk enhancer. Not only is MilkSplash zero-calories they are also perfect for busy parents who want their kids to drink more milk and make healthier beverage choices. Why are they perfect for busy parents? They are portable and tiny enough to fit into small spaces! Throw a few in your purchase and head out for the day. Also they are super easy to use, kids can easily grab one pop the lid and flavor their own milk. I'm not sure about your kids, but if my kiddos feel they made something on their own they are more likely to try it and like it :). Plus they can decided how much or how little they want to add. And the fact they have so many fun flavors, colors and characters makes finding the perfect milk flavoring so easy! And if you are worried about finding them don't be, they can be located in most Walmarts and select Targets! So I set up the Milk Splashs on our table and told my little guys to each pick their own. I saw right away huge smiles, they love the fun little characters. At first they were going to pick which "color" they liked most. After I explained each color was different flavor they asked which color was which flavor. After both of my little guys picked a flavor I went to my fridge and got them each a glass of milk. I then popped back the lids and handed them to my kids. At first they looked at me as if they thought I did it by accident. After some reassuring I convinced them, that yes I was letting them mix their own. So they gave it a small squeeze or 2 and then both stopped. I thought for sure they were going to use half the bottle, but they told me that a little was enough, because it turned their milk colors already. Now the last and most important test. So we all know something can be beyond amazing on paper, but when you taste it, its a whole other story. Quinn dove right in, as I said before the kid loves his milk! Brandon on the other hand gave a small sip, then another and another and was eventually taking big sips! He at one point asked if he could add more Milk Splash. I of course told him to go for it! A few times this week I sent them into school with him, thanks to their small size I can put them in his lunch box. After several uses we still have some left. So a little truly does go a long way! And if you don't want to take my word for it, please see the photo below as my little guys give a thumbs up in approval. Milk Splash is yummy, affordable, easy to use, portable, a healthy choice and fun! What more could a parent and child want in a milk flavoring! !